Although it is a hot button issue, family planning has been done for thousands of years with the aid of various plants. Some of these methods are still employed to this day (although not under the banner of modern medicine) and I will be exploring the different species in subsequent posts. The Silphium plant went extinct before the end of the 1 century AD and legend states that the last stalk was given to Emperor Nero. Modern science has not been able to determine exactly what the Silphium plant was. It was likely in the genus Ferula, or giant fennel, as the plant Ferula assa-foetida was used as a substitute in the first century both for medical and flavoring use. Another curious fact about human interaction with the Silphium plant is the common heart symbol. Shown on coins from before the common era the Silphium seed pod is shaped in the classic heart shape. Certainly, it makes sense that a plant that is able to control the effects of amorous affairs would morph into the modern symbol of love. The Silphium Connection. Celator 9(2):6-8. Feb, 1995. 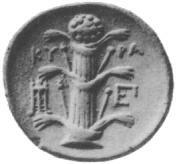 The coin’s design is one of the few surviving images of a seed pod of the extinct Silphium plant.